The Central Area, (a prime area) also known as the Central Business District, is the financial and commercial centre of Singapore. Glittering skyscrapers and large shopping malls crowd each other along the streets. In some places, historic shophouses and temples present a pleasing contrast to the urban modernity of the rest of the area. As immigrants from China, India, Malaysia and other parts of the world arrived here in colonial times, they formed communities among themselves and Little India, Chinatown, and Kampong Glam were created. Today, these places still exist as pockets dedicated to their culture, trade and way of life. They are great places to get authentic Chinese, Indian or Malaysian food, crafts and products in the city. The Downtown Core is the financial district of Singapore, the encompassing important and highly valued areas of Chinatown, Raffles Place, the Singapore River, Bugis, the Colonial District, and Marina Centre. It is the country’s most densely populated area, with the most expensive real estate. Upscale, highly sought-after residential complexes here include the Icon at Tanjong Pagar, Pinnacle at Duxton, The Sail @ Marina Bay and the Marina Bay Residences. Future developments include One Shenton Way and Scotts Square. Parking for private vehicles is a problem in the Downtown Core, but it is well served by MRT stations, buses and taxis. A new network, the Circle Line, is under construction and will connect to the existing mass transit system. This will make the Downtown Core even more accessible. There are several educational institutions here, from child play centres to universities. These include the Anglo-Chinese School International, the Australian International School, the Nanyang Academy of Fine Arts and Singapore Management University. Chinatown was the residential neighbourhood of the Chinese community in Singapore from the time of Sir Stamford Raffles. This large area in Outram near the Downtown Core is rich in Chinese culture and history. However, since the large majority of Singapore’s population is now Chinese, today’s Chinatown is also another business district in the area. It is the place to go for good Chinese food and assorted products. Originally called Commercial Square, Raffles Place was established in 1819 when then-Resident Major William Farquhar and Sir Stamford Raffles saw a need for a commercial house to accommodate the growing businesses and trade in the area. A swampy area beside the river was filled with earth and construction on office and residential buildings began. The Singapore River runs through the Central Area and has always been a major part of Singapore’s economic success. This was where ships docked during the colonial days and brought merchants and goods from China, India, Indonesia, and other countries. , Clarke Quay, and Robertson Quay are places for business, entertainment, and hotel and residential developments respectively. Take a tour down the river on a bumboat or indulge in water sport activities in the area. Bugis, or Kampong Bugis, was home to the Bugis people who came from Macassar, Celebes in the Malay Archipelago. They were mostly traders who gave the area its character and culture. It is a lively area filled with shops, offices and hotels in mostly low-rise buildings and shophouses. There is a wide range of hotel accommodations, from the Bugis Backpacker’s Lodge to the Hotel Intercontinental and the posh Raffles Hotel. There are many mid-range hotels in the area as well.
. Bugis has two popular shopping areas. Bugis Junction is a shopping mall connected to the Hotel Intercontinental. Bugis Village is a night market with dark, narrow corridors filled with stalls selling all kinds of items. Bras Basah. Its name means “wet rice river”. This area was mainly occupied by Indian immigrants who worked as laundrymen in dhobis, or Indian washing communities. They washed the clothes in the river that is now known as Stamford Canal. Bras Basah Complex is a bibliophile’s haven. Big bookstores, secondhand bookshops, arts supplies stores are here, and the National Library is nearby. Arab Street. Cloth traders from Yemen established their clothes shops in the area, which developed into an enclave of the Arab community. As a reminder of their culture and heritage, Sultan Mosque is in the centre of the street. Books on Islamic culture, beautiful textiles, non-alcoholic perfumes, and handmade carpets are also available here. Aside from being its business centre, the Colonial District is also Singapore’s cultural hub. Here, buildings dating back to Singapore’s foundation stand beside modern skyscrapers and shophouses. Dozens of these old structures have been restored and are once again in use. is a lovely place for a leisurely stroll. Set on the top of a hill overlooking Orchard Road, it was the site of Sir Thomas Stamford Raffles’s residence and his botanical garden, the first in Singapore. From here, you may do a spot of shopping at Suntec City Mall, Marina Square and Millenia Walk. The more adventurous can try a G-Max reverse bungee at Clarke Quay or catch a bumboat ride down the Singapore River. After a long day, watch the Crazy Horse Paris Cabaret Show at Clarke Quay or take in the period architecture of historic buildings such as the Raffles Hotel or CHIJMES, which started out as the Convent of the Holy Infant Jesus (CHIJ) and is now a complex of buildings, covered walkways and courtyards housing retail outlets, restaurants and cafés. CHIJMES’ pride is the beautifully restored Hall, once the chapel and now one of the two historic buildings within the complex. Marina Centre, along with Marina South, was reclaimed to form the beautiful Marina Bay. Kite flying and soccer have become popular pastimes here. - Theatres on the Bay is sometimes called “the Durian” by locals because its shape and spiky roof might remind one of that tropical fruit. The glittery, eye-catching building is Singapore’s newest and biggest performance arts venue to date. Businesses at the Marina South have shut down to enable new projects to come up. Several upscale condominium buildings are now available for rent or sale, with many more under construction. The Marina Bay Sands is an integrated resort beside the Gardens at Marina South and Marina Bay Financial Centre, which will be completed by 2012. The green lung of the business district, the Museum Planning area contains a good mix of open spaces, historical buildings and monuments, educational and cultural institutions, and modern office towers. A leisurely stroll around Museum will bring you to some of Singapore’s oldest buildings, many of them historic firsts for the country: the 175-year-old Armenian Church of Saint Gregory the Illuminator, Singapore’s first Christian church; the Central Fire Station, a sprawling, red-brick building that is the oldest existing fire station in the country; the Cathedral of the Good Shepherd, Singapore’s oldest Catholic church; Cathay Building, Singapore’s first skyscraper, now redeveloped into The Cathay, a mixed residential and commercial building; the National Museum of Singapore, the country’s first museum, now in a grand building on Stamford Road; and the Old Hill Street Police Station, which had Singapore’s first jail. Museum Planning area includes three parks. Fort Canning Hill Park, which was designed as a military fort, contains the residence of Sir Thomas Stamford Raffles. It has several military relics, barracks, and a specially designed Spice Garden mimicking the original garden created by Raffles. Istana Park across the main gate of the Istana affords the guest a view of the monthly changing of the guards. It is also a venue for musical and cultural performances. Bras Basah Park is an nice green area near Bras Basah Road. True to its name, there are several museums in the planning area. Apart from the National Museum of Singapore, there are the Singapore Art Museum, the Asian Civilizations Museum, the National Archives of Singapore and the Singapore Philatelic Museum. For a change of pace, visitors can then go shopping at Park Mall, The [email protected], and Plaza Singapura. River Valley has many upscale residences and condominium buildings. Historically, this place near the Singapore River is where the wealthy merchants built their homes to get away from the noise and crowd of town. Today, River Valley Road is the gateway to the more peaceful residential areas of Bukit Merah and Alexandra. are guarded by tight security. 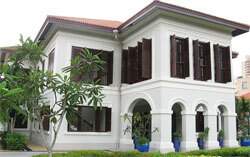 Lee Kwan Yew, Singapore’s first prime minister, had his home here. The homes of Singapore’s elite are in developments such as Riverdale Residence, Leonie Hill Residence, Horizon Towers, and Grange Heights. Just visiting, or house-hunting in the area? You can stop at hotels and serviced apartments such as the Great World Serviced Apartments, River View Hotel, or Neplodge Hotel. The Grand Copthorne Hotel and Novotel are on Kim Seng Road just off River Valley Road. Not far from these is Great World City, a huge complex with fashion outlets, electronics and food stores. What began as an area where nutmeg plantations, fruit orchards, and pepper farms flourished is now a 2.5-kilometre stretch of prime commercial area. Orchard is a lively sprawl of huge shopping centres, upscale restaurants, cafés, bars, nightclubs and hotels. As the population increased and the original city centre became overpopulated, plantations were turned into residences for the more affluent citizens, and the area slowly developed into the Orchard we see today. Orchard is one of Singapore’s main commercial areas, as large shopping centres fill up most of the 2.5 kilometre stretch of Orchard Road. These include Wheelock Place, Tangs (one of the first department stores in Singapore), Wisma Atria, and the Paragon Shopping Centre. Sidewalk vendors have a lot of interesting and inexpensive things to offer street shoppers too. Cafés, restaurants, and establishments offering services such as spa treatments also make Orchard a popular place to be. Residential condominiums in the area are upscale and the cost of living is high. The neighborhood’s hotels include the venerable Goodwood Park Hotel on Scotts Road, the Elizabeth Hotel, Park Hotel Orchard, Sheraton Towers Singapore, Shangri-la Hotel Singapore and Orchard Hotel Singapore. Cairnhill is a hilly area near Orchard Road. In the mid-19th century, it was the site of a nutmeg plantation and the house belonging to the plantation owner, Charles Carnie. It was known as Carnie’s Hill. Numerous residences have been built here since then. Today, Cairnhill is a mix of grand villas, modern luxury apartments and well-restored pre-war terraced houses. Nearby Killiney, Leonie Hill, and Oxley are upmarket areas with more residential choices to choose from. Quiet and sleepy Newton sits between Orchard and Bukit Timah—both bustling, upscale areas favoured by Singapore’s elite and the expatriate community. Newton is dotted with upscale houses, flats and condominiums. Its spacious and green environment belies its location in the heart of the city. Luxury apartments and townhouses comprise the property rentals in the area. Many are on Chancery Lane and Dunearn Road. Newton’s hawker centre—an open-air place where people can buy inexpensive meals from food stalls—is the most popular place this side of town. Known for their good food, this is where clubbers head to after a night on the town. Not much entertainment is available in the area, but Orchard is near enough that it hardly matters. The district of Outram is in the Central Area near the Downtown Core. Its most famous neighbourhood is Chinatown, still a popular business and cultural area even though the majority of Singapore’s population is Chinese. Attractions here include Maxwell Food Centre, a popular hawker’s centre—an open-air place where vendors sell inexpensive food from stalls. Another historic neighbourhood in Outram is Tanjong Pagar, where the Indian sepoys were first stationed. Before the surrounding land was reclaimed, Tanjong Pagar was also the waterfront. The Thian Hock Keng Temple here was built in 1821 by grateful seamen for their safe passage. The Telok Ayer Chinese Methodist Church was built by English and American missionaries and played a significant role in the spread of Methodism in Singapore. Found along Duxton Road and Duxton Hill are 2- and 3-storey shophouses and terrace houses built in the 1890s for wealthy Chinese businessmen and restored by the Urban Redevelopment Authority. Several municipal buildings are in Outram, among them Singapore General Hospital, Central Narcotics Bureau and the Police Cantonment Complex. Rochor is composed of 10 mainly business and commercial sub-zones with some residential buildings. One of the most well-known zones is Little India, a popular neighbourhood east of the Singapore River that is home to a large part of Singapore’s Indian community and a popular place for locals and tourists to go when they are looking for a flavour of India. Shooping centres like the large Tekka Centre are situated close to temples, mosques and churches.